A variant of the Jenny Wren, the Mini Jenny Hammer Poll by RMJ Tactical is designed to be the lightest, most easy-to-conceal tomahawk in the RMJ store. As the story goes, the RMJ team was deciding which of their 'Hawks would be best for concealed carry, since one of them would soon be in Africa for several weeks. They soon realized that a smaller version of the Jenny Wren would fit the bill, and thus the Mini Jenny was born. Like the Jenny Wren, the Mini's head is milled from 0.25" 80CRV2 steel at 57-58 HRC, with exactly the same dimensions: a forward edge of 2 5/8". It's also crafted with the same differential heat treatment, with the same improved impact resistance and hardness along the forward edge and spike, and equivalent flexibility in the spine. The only difference between the two is the length of the handle. 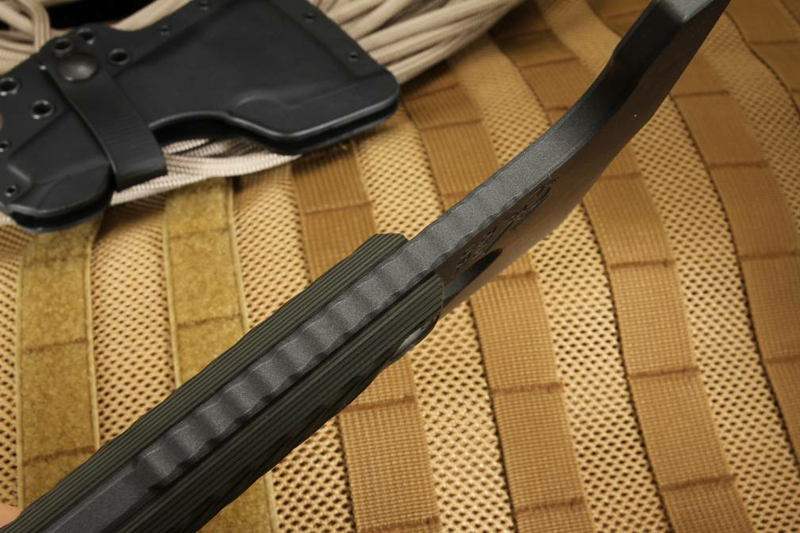 Its multiple sharpened edges still allow for a variety of cutting tasks, and there's still plenty of material directly behind the spike to maintain its stability. This lets the Mini fulfill tasks just as well as its big sister, whether that means breaking locks, punching through concrete, digging, or acting as a pry bar. And the cerakote finish gives the Mini the same resistance to abrasion and wear, corrosion, chemicals, and impacts as the Jenny Wren. 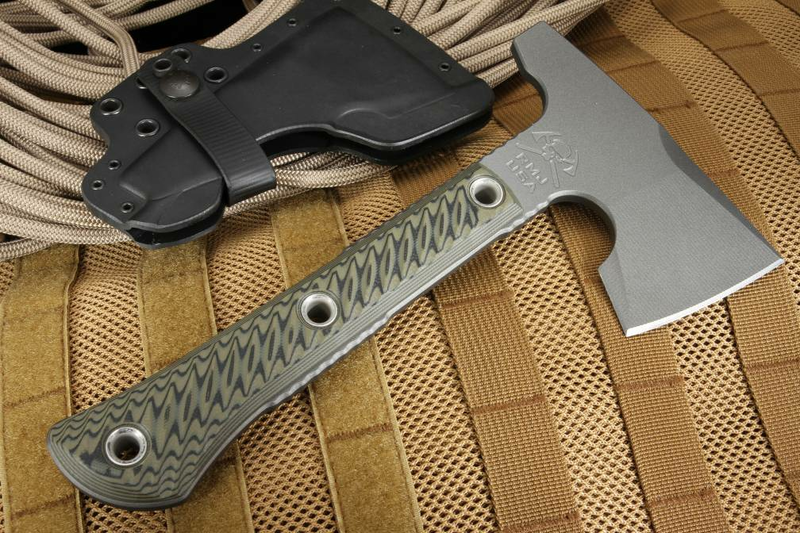 The handle remains 3/8" thick, with the same full tang I-Beam design and G-10 3D machined handle scales. However, the overall length is only 9.4", and it weighs just over one pound (16.7 ounces). Oval-shaped for control, the handle is made from the same high-quality 80CRV. Unique to the Mini, there are new choils which allow the user to choke up on the 'hawk, making sure you'll find a comfortable swing quickly despite the smaller size. 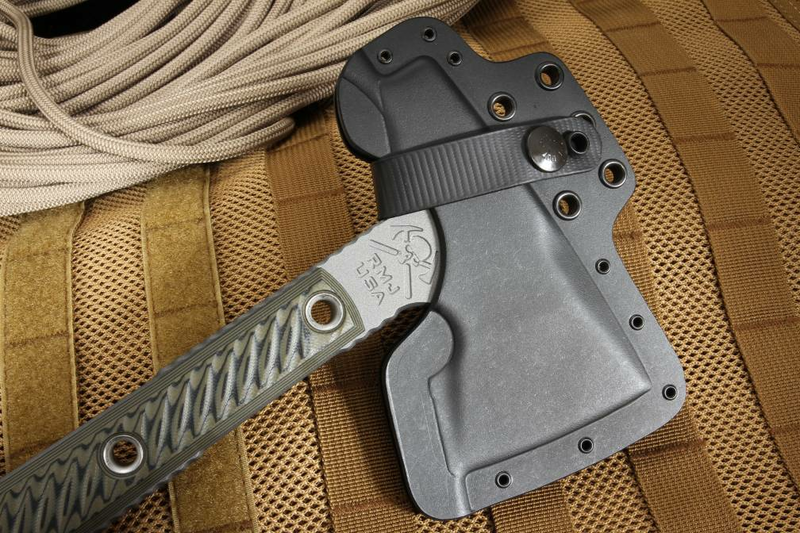 The handle comes in the same choice of colors black, hyena brown, or dirty olive and the Mini Jenny is even more suited to concealed carry with its bottom-eject Kydex scabbard. The nine-inch length means that, even when the handle is pointed up, it's easy to wear and won't get in your way. 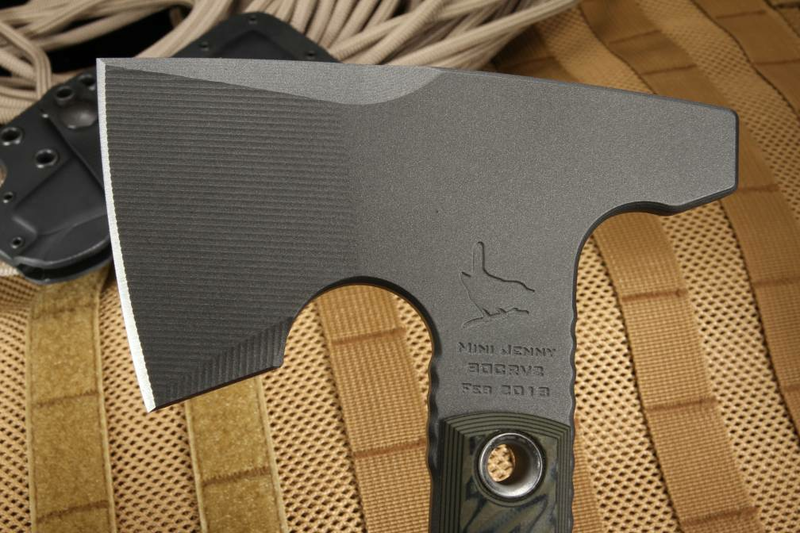 The Mini Jenny Hammer Poll is made in the USA with a 100% lifetime guarantee; order yours today through KnifeArt.com. 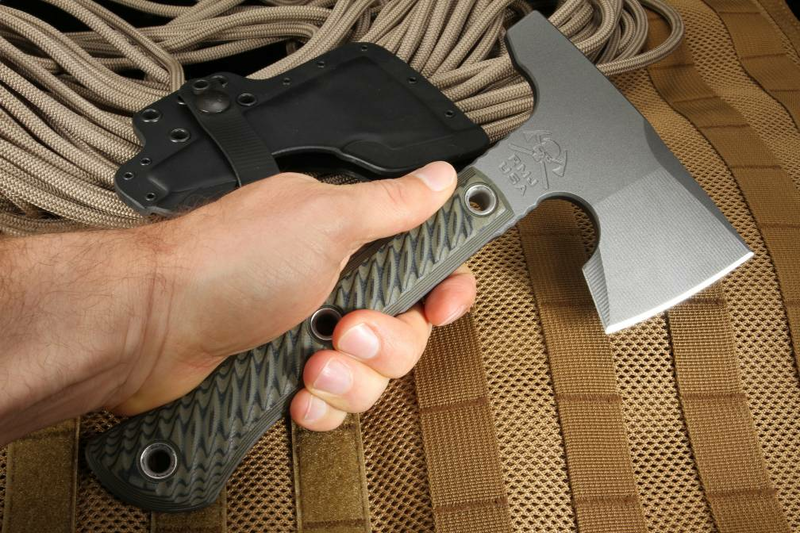 KnifeArt is an authorized dealer for RMJ Tactical, with twenty years experience in the high-end bladed weapons business. They offer same business day service with free shipping, a selection of only the finest quality weapons, and easy exchanges on all purchases. Extreme caution should be used with handling this tomahawk and removing it from the sheath - there are multiple sharp edges and points.